Greece's far-right, anti-immigrant Golden Dawn party came third in the election with 6.3% - even though its leaders are in pre-trial detention. Their result translates into 17 parliamentary seats, out of 300. But it is not clear if any of the party's MPs will be allowed into the chamber. In 2012 they got 18 seats, but the leaders were later accused of criminality and they remain in custody. 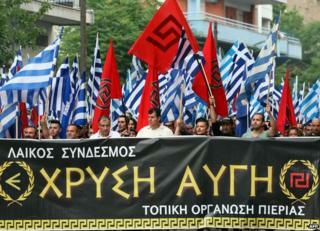 Golden Dawn uses Nazi-style symbols and has been linked to street violence. Last October party leader Nikolaos Michaloliakos and his fellow MPs were accused of running a criminal organisation. Dozens of other party activists were also accused by state prosecutor Isidoros Doyiakos, who said they should stand trial. The investigation was launched after the 2013 murder of a left-wing, anti-racist rapper, Pavlos Fyssas. A man held for the stabbing claimed to be a Golden Dawn supporter, though the party denied any link to him. Golden Dawn won three seats in the European Parliament elections last May, with nearly 10% of the vote. The party was founded in 1985 but its popularity soared when the financial crisis rocked Greece in 2009-2010 and hardship spread under the tough austerity demanded by the EU. Nationalists have gained ground in elections across Europe, including France's Front National, Hungary's Jobbik and the Sweden Democrats. But Golden Dawn is seen as the extreme end of the spectrum. It was widely believed that the prosecution of Golden Dawn would put many voters off the party, but Sunday's vote suggests that "a section of Greek society subscribes to this kind of hardline nationalist rhetoric", Vassilis Monastiriotis at the London School of Economics told the BBC. Mr Monastiriotis, a Greek political economist, said Golden Dawn had managed to run for election because constitutional experts had drawn a distinction between the party and the underlying - allegedly criminal - organisation. In the campaign, Golden Dawn's anti-austerity rhetoric subsided, he said, "so what remained was anti-establishment rhetoric, while the anti-austerity platform was better represented by [left-wing] Syriza and the [centre-right] Independent Greeks". Golden Dawn is perceived to have support in the armed forces and police, but it has "appealed to a wide spectrum of society", Mr Monastiriotis said. They are especially strong in Athens and the southern Peloponnese, but weak in northern Greece. Despite its nationalist ideology, in 2012 it attracted many votes from elderly people who had lived through the Nazi German occupation and the 1960s-70s Greek military junta. Mr Monastiriotis said the ideology fitted the description "neo-Nazi", including the idea of Greeks being a "superior race", aggression towards immigrants, and hostility towards the EU and Nato. He said that in Sunday's vote the party benefited from the fragmentation of the centre-left, which split into The River (To Potami), socialist Pasok and George Papandreou's Movement of Democratic Socialists (Kinima). Petros Fassoulas, a Greek political analyst at the pro-EU European Movement, says Golden Dawn has "a very strong activist network on the ground, capable of producing leaders quite quickly". He told the BBC that activists were good at "buying" votes by distributing free food and clothes to poor people, but also relied on "intimidation". "Some areas are so impoverished that their xenophobic message goes down well. There is a significant proportion of the Greek population that buys that kind of rhetoric." Their manifesto is "similar to those of other neo-Nazi movements in Europe," he said.